Formerly the WSCGA Desert Event, this is the SCGA's premier Championship for women looking to compete with a partner. Two-person teams will compete over 36 holes of four-ball stroke play, at two of the desert's premier golf facilities. Open to female SCGA members of all skill levels. 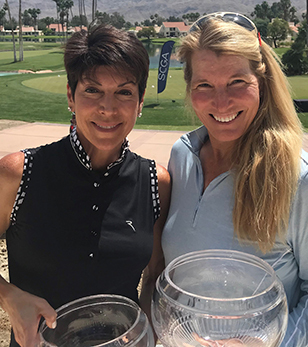 After two days of high-intensity battle in the Palm Desert sunshine, Corey Weworski and MK Zordani emerged victorious in the inaugural SCGA Women’s Four-Ball Championship. The winning duo opened the championship with a 2-under 70 in the best-ball format, leaving them on the outside looking in after day one. Sitting five strokes back, Weworski/Zordani were in chase mode, looking to track down first-round leaders Kathy Kurata and Caryn Wilson who posted 7-under 65 to set the pace. Coming out of the gates strong, Weworski/Zordani were rolling early. The duo put the pedal to the medal, reeling off five consecutive birdies to open their round and put everyone on notice. Making the turn at 7-under for the day and 9-under overall, they found themselves with a one-shot advantage and were able to close out the championship with a birdie on the final hole. Kurata/Wilson finished second with Mina Hardin and Jennie Robinson third.